London loves outdoor movies – and where better to see a movie outdoors in London than on the river, surrounded by some of the city’s most incredible sights? Time Out’s very own Movies on the River is returning to the Thames in June for 12 weeks after a sold-out run last year. The eagle-eyed will notice how some of the films have a distinctly watery theme: ‘Jaws’, ‘The Shape of Water’ and ‘Dunkirk’ are all playing. But not all the movies play on watery themes. This unique movie boat is also screening recent hits like ‘The Greatest Showman’, ‘Baby Driver’ and ‘Get Out’, as well as crowd-pleasing classics like ‘Casablanca’, ‘Romeo + Juliet’, ‘Mean Girls’ and ‘Breakfast at Tiffany’s’. 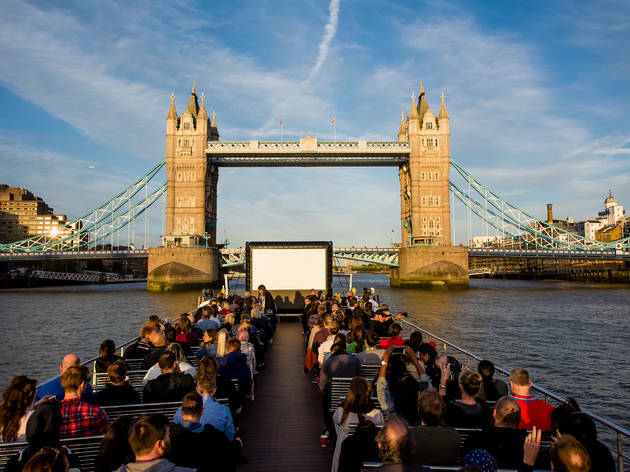 Film-goers will board Movies on the River near Tower Bridge, before taking a sunset cruise upriver past all the sights of the City and the West End. The boat then returns to the Pool of London and docks in sight of London Bridge, The Shard and other sights to show the movie. There's a bar on board and blankets are available if it gets chilly. You’ll hear the film through silent disco-style headphones, and if it starts to drizzle, don’t worry, we’ve got ponchos below deck! ‘The Shape of Water’ actually on the water? You’d be mad not to jump on board. Time Out presents Movies on the River with City Cruises runs five nights a week (Tuesday to Saturday) for 12 weeks, starting on Wednesday July 13. You can explore the lineup and buy tickets here.